Just yesterday I reported that Thorsten Giesbert at Fraser Yachts in Palma had taken over the central listing for sale of the 28.95m motor yacht Phoenicia II and he's certainly springing into action quickly as he hosts an Open Day aboard her at Pier D14 in Marina Port de Mallorca on July 22nd from 10am to 1pm. To recap: Phoenica II was custom built by Astondoa in 2001 and Thorsten says she’s totally unlike any other yacht from this yard and has a truly luxurious interior featuring burl olive wood bookmatched panelling throughout. 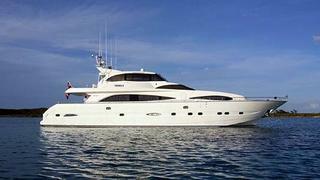 Accommodating six guests in three staterooms, Phoenicia II is asking €2.95 million VAT paid.